When is a Christmas Tree not a Christmas Tree? Apparently, when it's the Tree of Giving, representing the Salvation Army's area fundraising. 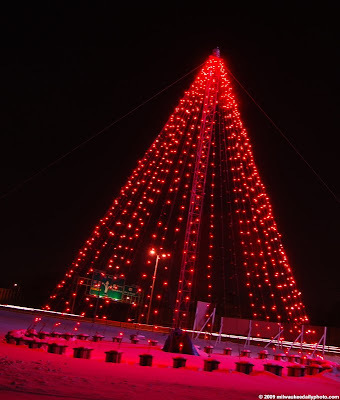 The "tree" was lit on November 17, and it still stands in front of State Fair Park over two months later. I'm not sure if it's there until the fundraising goal is met, until the snow melts, or... ? As all Americans are aware, today was the celebration of Martin Luther King Jr's birthday, and a Federal holiday. Our President-Elect called for a national day of service. If you didn't take the time to help someone today, try to soon. I'll be doing some service time this Thursday. why the tree is pink? The lights are actually red. Some of the light reflecting off the white snow reflects as pink. I was thinking about doing some color correction on it, but decided I liked it the way it was.